Awards of £200 each have been made to two students from Pilton Community College, Lucy Lake and Matt Steele, to help with funding of their trip to Amigos' Kira Farm Development Centre near Kampala, Uganda. They will be learning new skills and working in the community. The trip takes place in October 2018 and they will be telling us all about it on their return. Click on the logo to learn more about Amigos. 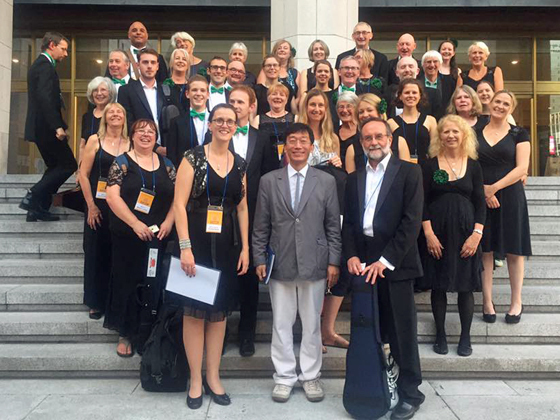 Two members of the North Devon Sinfonia, winners of BBC2's Great Orchestra Challenge in 2015 and the amateur orchestra representing the UK at the Seoul International Community Festival in September 2017, were awarded a small grant to help towards the very high cost of the trip. The orchestra needed to raise £38,000 and found itself £6,000 short. As well as their own fund-raising, financial support has come from Devonshire Living, TDK Lambda, West End Precision, Bray Leino, Philip J. Milton and there have been grants by Rotary Clubs, the Bideford Bridge Trust and Fullabrook and private donations. Our award was made because each orchestra member themselves then had to raise an additional £122 to close that funding gap. In the photograph the orchestra is seen with Mr Park, the organiser of the Festival. 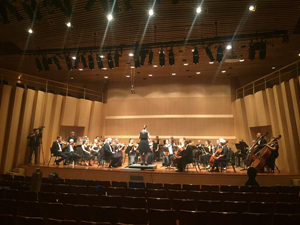 Whilst in Seoul, the orchestra gave two performances in the Sejong Chamber Hall and the Sejong Grand Theatre alongside other orchestras from around the world. Dan Kent, the NDS Treasurer said, "The Festival was a fabulous example of community music-making with participants from school children up through all ages to senior citizens. It was about people coming together from across the globe to celebrate together, share a love for music, exchange cultural ideas and build bridges of friendship". And all this happened despite the backdrop of impending military and political threats. Several of the North Devon Sinfonia members also participated in an amazing collaborative international orchestra made up of players from around the globe. Click on the above link to follow the orchestra on Facebook or click on this photograph of them on stage in the TBS Art Theatre in Seoul to watch one of their performances - the Ralph Vaughan-Williams English Folk Song Suite No 1 - Seventeen Come Sunday. The CIO is pleased to have been able to help, in even such a small way, facilitate the experience and look forward to hearing of further beneficial outcomes in North Devon. Reports on the outcomes of the award for the Pilton Church Hall Permanent Bar will be available in due course.